Buckingham Hotel? -- More Like "Barkingham Hotel"! 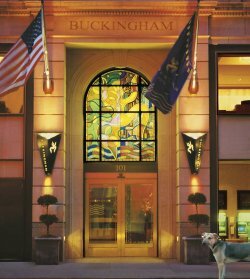 If you have pet-owning friends coming to visit or, as in my case, you're a NYC dweller who needs a place to take the wife and pup while some work gets down on the apartment, the Buckingham Hotel at 101 West 57th Street will get your tail wagging. 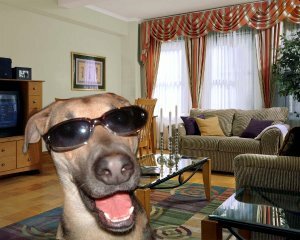 Not only are dogs and cats welcomed with open arms, but the contemporary-designed, two-room, apartment-sized suites are beautiful! The key to the hotel's pet-friendly nature lies in its management. Managing partner Stephen Shapiro is married to world-famous veterinarian, Dr. Amy Attas, who runs the CityPets house-call veterinary practice, writes a regular column for Good Housekeeping and has a weekly radio spot called "Pets and the City" on the Business Travel Radio Network. Stephen and Amy live in the Buckingham with their two pugs Leonardo and Winston, and firmly believe that no "home away from home" should force families to leave their furry friends in a kennel. In addition, the Buckingham is only one block from Central Park, so even a cold winter walk was a joy. Henry got to see a bunch of horses, walk on the iced-over lake and even bark excitedly at a raccoon. Interestingly, after only two trips outside, Henry had memorized the location of the Buckingham entrance, excitedly jogging into its beautiful lobby with no prodding from the parents. Aside from a bit of barking to alert us of the maid's presence in the hall, Henry was a lovely little gentleman the whole time. However, if you think that your dog might have barking or howling issues, a hotel might not be the best idea. The other guests have a right to their comfort too! To be fair, I must stress that -- as lovely an experience as we had -- it didn't hurt that our stay was "on the house." Still, room rates seem to run about $200 a night, which isn't bad at all for NYC (especially considering that most NYC hotels ban pets!). Although we didn't use any of the other pet-friendly amenities, I should mention that the Buckingham offers professional dog walking, grooming, pet sitting, in-room veterinary services and a special arrangement allowing for a 'Dog's Day Out' at the Biscuits and Bath doggie spa. These offerings would be of particular interest to out-of-town guests looking to keep Rover happy while they visit nearby landmarks like Carnegie Hall, the Museum of Modern Art, Lincoln Center or shopping havens like Bergdorf Goodman and Tiffany's. Personally, my little NYC family just enjoyed lazing around, reading and playing with Henry during our weekend 'vacation in midtown.' For more information, call (212) 246-1500. Click here for other articles about dogs.